Guide fee, use of helmet, harness, climbing shoes, and all required climbing equipment. Carpool to base area, personal clothing, hiking shoes, snack food, water, and guide gratuity. Join the guides of the Northwest Mountain School for a fun and educational half-day adventure at Three O'Clock Rock, Darrington's local climbing crag. This scenic crag has long been a part of Darrington's long history in Washington climbing. On your trip you will learn to belay, learn the basics of crack and face climbing, and have the opportunity to climb a variety of top-roped routes on the excellent rock slabs high above Darrington. To reach the crag you will undertake a short, hike to the base of the wall from the Eightmile Creek trailhead, recently renovated by the Washington Climbers Coalition. 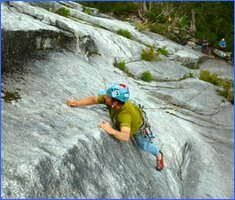 All climbing equipment is provided and the program is open to climbers with no previous climbing experience or experienced climbers looking to sample a bit of the great climbing to be found just a short drive from Darrington. 8:30 am: Arrive at Northwest Mountain School booth and check-in with the guides and staff of the Northwest Mountain School. At this point we will confirm that we have completed paperwork for each participant and distribute climbing harnesses, helmets, and climbing shoes. Don't be late as the group will leave on time at 9:00 am for the drive to the climbing area and we need a good 30 minutes to get everyone checked-in and organized. 9:00 am: Drive to the trailhead for the old Eightmile Creek trail, located about 6 miles up Clear Creek from the Mountain Loop Highway on forest road #2060. The guide will be in the lead car and all participants will need to follow the guide as the trailhead is not obvious. The road is passable by car, but unusually low clearance cars are not recommended. 9:45 am: Arrive at trailhead and hike to base of climb. The hike in takes about 15 minutes and you will want comfortable hiking shoes (not flip flops). We will hike in as a group and the guides will have the routes pre-rigged. 10:00 am - 1:00 pm: This time will be spent climbing on a variety of top-roped routes ranging from 5.5 to 5.10a. The crag is a slab with good opportunities for both friction and crack climbing. You will learn to belay, lower, tie-into the climbing rope, put on and use a harness, and use a climbing helmet. 1:00 pm - 2:00 pm: When we are done climbing we will hike back down to the cars and return to the Northwest Mountain School booth at Summer Meltdown. 11:30 am: Arrive at Northwest Mountain School booth and check-in with the guides and staff of the Northwest Mountain School. At this point we will confirm that we have completed paperwork for each participant and distribute climbing harnesses, helmets, and climbing shoes. Don't be late as the group will leave on time at 9:00 am for the drive to the climbing area and we need a good 30 minutes to get everyone checked-in and organized. Noon: Drive to the trailhead for the old Eightmile Creek trail, located about 6 miles up Clear Creek from the Mountain Loop Highway on forest road #2060. The guide will be in the lead car and all participants will need to follow the guide as the trailhead is not obvious. The road is passable by car, but unusually low clearance cars are not recommended. 12:45 pm: Arrive at trailhead and hike to base of climb. The hike in takes about 15 minutes and you will want comfortable hiking shoes (not flip flops). We will hike in as a group and the guides will have the routes pre-rigged. 1:00 am - 4:00 pm: This time will be spent climbing on a variety of top-roped routes ranging from 5.5 to 5.10a. The crag is a slab with good opportunities for both friction and crack climbing. You will learn to belay, lower, tie-into the climbing rope, put on and use a harness, and use a climbing helmet. 4:00 pm - 5:00 pm: When we are done climbing we will hike back down to the cars and return to the Northwest Mountain School booth at Summer Meltdown. Step 1: Submit Online Registration: To register for your Summer Meltdown 2015 Rock Climbing Adventure complete the online application here. The cost is $75 per person. You may register for yourself or for a group of people, but the person making the registration is responsible for payment for each individual they register. Registrations are processed on a first-come, first-serve basis. It is recommended to call the office at 509-548-5823 to confirm that there is still space on your preferred date. We have space for up to 6 individuals on each program, but we will add a second 6 person group to each session if there is interest. Step 2: Make online Payment: Payments may be made online by clicking here: All payments are non-refundable within 60 days of the start of the program. 25% of your payment is refundable if you cancel your space in writing by contacting our office no less than 60 days before the start of your trip. Payments can be made by Mastercard, Visa, or online check. Step 3: Receive Confirmation and Pre-trip Materials: Space cannot be reserved without completing the online registration and making the payment for each space. Once we have received your registration and payment our office will contact you to confirm your spot and will send you a pre-trip e-mail with all the details such as where to meet, what to bring, and a reminder of the schedule posted above. You do not need any previous climbing experience to take this program. You do need to be able to safely hike into the base area on an unmaintained climbers trail. If you have any relevant medical conditions or physical limitations these should be detailed in your registration. If you have any concerns about the program do not hesitate to call our office at 509-548-5823 to discuss your participation in the trip. All people under the age of 18 must sign and acknowledgement of risk form that is also signed by their legal parent or guardian. These forms can be signed on the pre-trip orientation at the Northwest Mountain School Booth at Summer Meltdown on the morning of your trip. If these forms are not received before the group departs for the climb those with unsigned forms will not be able to participate and no refund will be given. People under the age of 16 may participate, but they must have a parent or guardian present for the duration of the activity. If the parent is not climbing they will not be charged, but they must still sign a separate acknowledgement of risk form. If at the time of your program the weather is too inclement for the activity to take place you will receive a full refund. This decision is made by the Northwest Mountain School. If possible, we will reschedule you on subsequent days at Summer Meltdown. If you simply do not show up, or are unable to attend for any reason you will not be given a refund. The Darrington area has been explored by rock climbers since 1969 when NW legend Fred Beckey and friends climbed Witch Doctor Wall, using access provided by recent logging in the area. Access has always been a key issue as most of the access if via logging and US Forest Service Roads, many that could use updated maintenance to support regular vehicle traffic. The area is host to some very long and challenging rock climbs, many at a very high-level of difficulty. Classic features include Witch Doctor Wall, Exfoliation Dome, Green Giant Buttress, Three O'Clock Rock, and Squire Creek Wall. The WCC is a non-profit organization that promotes access to Washington's State's excellent climbing resources. The WCC's activities include land acquisitions, trail maintenance projects, trailhead improvements, toilet installation, clean-up projects, and often serves as a liaison between land managers and the climbing community. In September of 2014 the WCC coordinated the Darrington Trail Project and focused on the improvement of the Eightmile Creek Trailhead, which serves as access to the climbing at Three O'Clock Rock. More information can be found at WCC - Darrington. We are run by IFMGA Guides John & Olivia Race. NMS was formed in 1994 to provide climbing and wilderness education for young climbers and began running climbing trips on Glacier Peak in the mid 1990's. We are based in Leavenworth, WA where we live with our two young children. Today our programs run in a variety of destinations in Washington, the Western US, and Internationally with a focus on providing high-level educational and guided climbing, ski mountaineering, and avalanche courses. Portions of this program take place on US Forest Service lands under a commercial-outfitter and guide permits. The U.S. Department of Agriculture (USDA) prohibits discrimination in all its programs and activities and is an equal opportunity provider and employer.